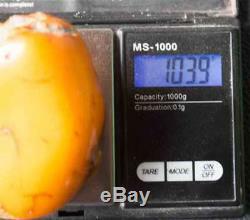 Huge natural Baltic Amber more than 100 g - Egg Yolk Butterscotch. 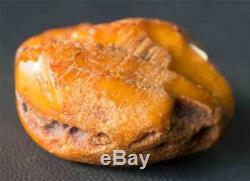 This is a huge piece of natural Baltic Amber with a nice Egg Yolk color. 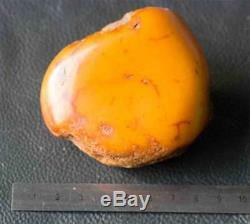 It measures about 77 x 66 x 38 mm and has a weight of more than 100 g. All our Amber comes from a old collection and is beside its geological age at least 20 years old. 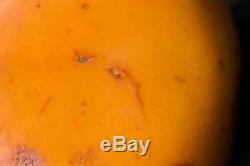 There are no repairs or tempering are done to this Amber. 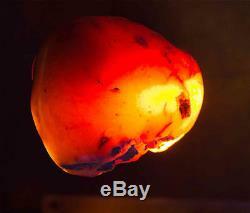 There is no Plastic or Bakelite or other repairs, its pure Amber. All offers Amber is Natural Amber what says It may has undergone mechanical treatment only (for instance: grinding, cutting, turning or polishing) without any change to its natural properties. We also add a lot of high res Pictures that allow you to see what you get. Papenburg, Emsland, nothern Germany, (Geschiebe). About 28 54 Ma old. It is for me imported to have satisfied customers. Profitate from profesinal German quality. If something is restored or reconstructed it would be precisely described in the description. We take care about it. Inside Europe we will send cost efficient with Hermes Parcel Service or for high value items mostly UPS. For international parcels we use most times DHL. In some cases we can send items also by letter Post as a registered letter. We pack all items well so that they arrive in good condition. We only use clean and good quality packing materials. We can accept wire transfers. More informations can be found on our. If you have any Questions or if something in unclear or not understandable dont hesitate to ask us a Question. 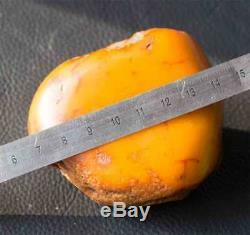 The item "Huge natural Baltic Amber more than 100 g Egg Yolk Butterscotch" is in sale since Wednesday, April 06, 2016. This item is in the category "Jewelry & Watches\Loose Diamonds & Gemstones\Loose Gemstones\Amber". The seller is "trifoss" and is located in Ribnitz-Damgarten.